Armie Hammer will not perform on September 7th or 8th. 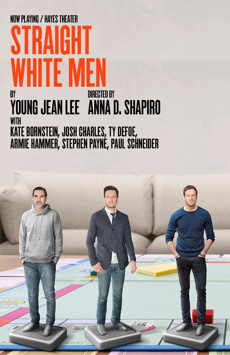 Armie Hammer and Josh Charles lead the Broadway premiere of Young Jean Lee's play. It’s Christmas Eve, and Ed has gathered his three adult sons to celebrate with matching pajamas, trash-talking and Chinese takeout. But when a question they can’t answer interrupts their holiday cheer, they are forced to confront their own identities.